Opening this weekend is director Timur Bekmambetov‘s (Wanted) Abraham Lincoln: Vampire Hunter. 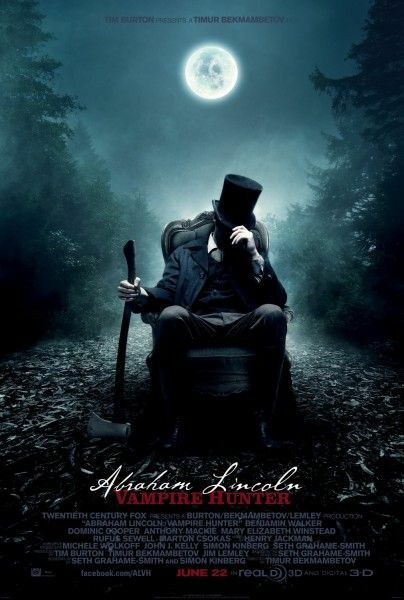 Based on the book of the same name from Pride and Prejudice and Zombies author Seth Grahame-Smith and produced by Tim Burton, the film imagines that Lincoln’s mother and grandfather were killed by a vampire and that the president’s resolve to end slavery was due in part to the “fact” that vampires were involved with the slave trade. Playing Lincoln is newcomer Benjamin Walker and he stars alongside Rufus Sewell, Anthony Mackie, Dominic Cooper, and Mary Elizabeth Winstead. For more on the film, here’s all our previous coverage and three clips with twenty minutes of behind-the-scenes footage. A few days ago I got to speak with Tim Burton in New York City. We talked about Frankenweenie, his favorite movies, the level of his involvement in the making of Abraham Lincoln: Vampire Hunter, the test screening process, how many deleted scenes there are from his previous films like Batman or Pee wee’s Big Adventure that have never been seen before, the status of the Beetlejuice sequel, and more. Hit the jump to watch. Finally, if you missed my video interview with Benjamin Walker and Anthony Mackie, click here.